Peter Ibarbo, Outreach Director for U. S. Congressman Steve Pearce’s Office, on left, seen meeting with FASF President, Ric Lambart, on the right in photo above. The men discussed upcoming plans for the Centennial of the Birth of American Air Power, which will be celebrated in Columbus, NM on Saturday, March 12, 2016. Photo courtesy of FASF member, Norma Gomez, Director of the Columbus Chamber of Commerce. The Congressman and other dignitaries are planning to attend the Centennial. The President of the El Paso Daedalian Flight 24 (A Fraternity of Military Aviators founded by World War I aviators), Charlie Overstreet and some of his fellow colleagues, all FASF members, are also planning to attend. The FASF has also been notified that other FASF members from the El Paso Chapter of the Military Officers Association of America (MOAA) will visit Columbus on the 12th, as well. 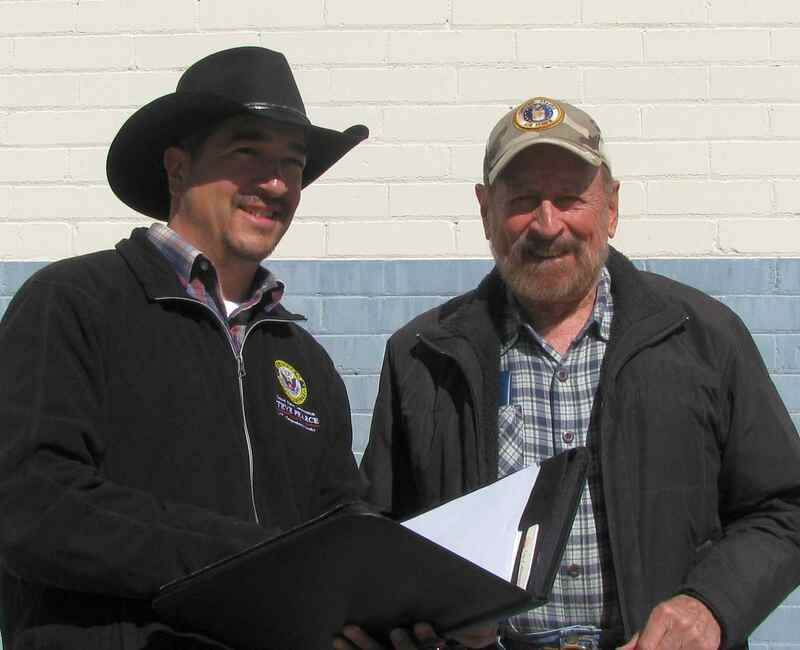 Bill Madden, FASF Airfield Site Chairman and some of his team will join Ric Lambart in making a special pictorial presentation at 10:00 AM in the Pancho Villa State Park Recreation Hall during the big celebratory event. Please keep checking back on this FASF website to remain up to date. Changes will be posted right here as they develop. This entry was posted in HOT NEWS! on February 11, 2016 by FASFRIC. Come One; Come All; Let’s Have a New Ball. Admin’d by Cesar Ivan Madrid, [Prince of Hope for Columbus’ Future]; & Karen Lee [Kween of ColumBing]. and anyone who has ever Visited or Intends to Visit our Wonderful “Magical Land of Nada”. “The Land of Enchantment, New Mexico”.